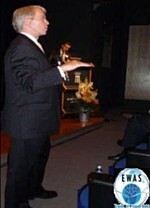 In honor of one of the pioneers in wrist arthroscopy, EWAS (European Wrist Arthroscopy Society) has established the ”Terry-Whipple-prize” which will be awarded to surgeons who have collected outstanding acknowledgement in the field of wrist surgery and/or wrist arthroscopy during their professional career. The winner could be from either part of the world, does not have to be a member of EWAS, but should have contributed substantially within the area of wrist arthroscopy to develop new techniques or new procedures, have participated in organizing and educating colleagues or otherwise been promoting the art of wrist arthroscopy. The prize is awarded yearly. Name of candidates should be sent to the board of EWAS before November 1st. The awarding committee will be composed by the President, Vice-President, Past President, Secretary General, Vice Secretary and past Secretary General of EWAS, who at the regular board meeting in November every year should discuss the candidates and nominate the winner. The winner will be notified personally with sufficient time, and will be presented at the next FESSH meeting Apart from the HONOR and a plaque presented to the winner, the prize is linked to an INVITED LECTURE at the EWAS symposia, The name of the Winner would stand in the EWAS archives. This prize does not have any financial support, but for non-FESSH members the registration fees of the Congress will be covered by EWAS. List of the winners of the previous years.